Advertisement for the Horton Mfg. Co., Bristol, from Recreation magazine, January, 1915. On March 8, 1887, Everett Horton, a Bristol mechanic, patented a fishing rod of telescoping steel tubes. The rod was lightweight and compact, and the steel tubes protected the line from tangling and snagging on branches while hiking to a favorite fishing hole. 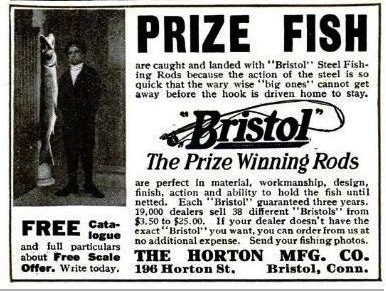 The Horton Manufacturing Company later formed in Bristol and produced a complete line of steel fishing rods, from fly tackle to deep sea. 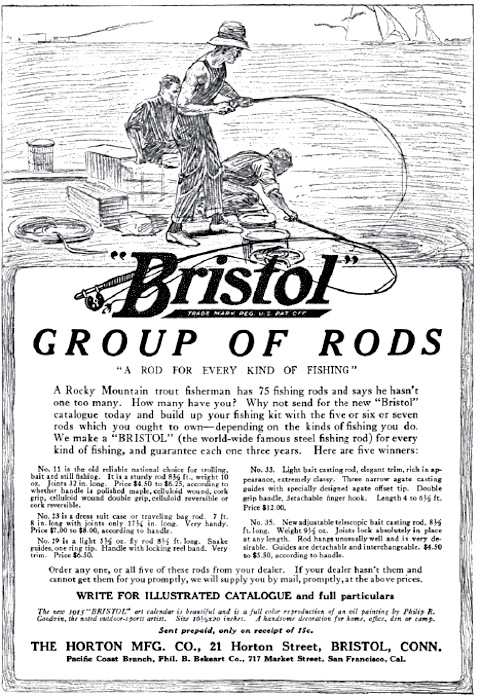 Ads for Bristol rods were seen across the country in magazines from Field & Stream to Popular Mechanics. Horton, Everett. Patent Number 359, 153 - Fishing Rod. 359,153. Bristol, CT, issued March 8, 1887. Link.